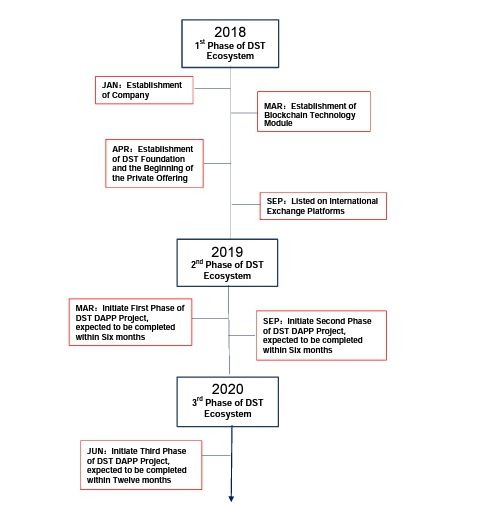 DST is a decentralized silver ecosystem with underlying blockchain technology, utilizing smart contract protocol to allow traditional silver mining industrial to digitize the industrial resources, increase assets circulation and production efficiency, as well as increasing the credibility of quality assurance through credible and sophisticated verification process and warranty card certification. – Token Sale 1.8% of total tokens for sale, or 10,000,000 DST. DST is a decentralized blockchain digital asset developed by DST on the basis of Ethereum, a token created with standard technology ERC20. In addition to traditional investment, ICO is a unique way of financing in blockchain industry. The so-called ICO means financing by issuing tokens. Token represents some income rights or shares of the project. Supporters of a project can invest in blockchain start-ups by subscribing tokens of corresponding value. Another characteristic of the ICO, unlike traditional ways of financing, is that the start-up companies do not keep a lot of shares of equity, but rather sell most of their shares to the investors involved in the crowd-funding. Driven by the Internet big data, the silver industry will go deeper into the integration of industry and financing, which is an integration on capital level. Through industrial financing, the financial capital operation is an important step of an enterprise in its development in capital and financial sector. For DST, the ICO in its development of financial sector is mainly due to three considerations. The demand of capital in the mining sector is large, the rate of return is low and the return rate of the financial assets is relatively high. It is an objective need for the development of the mining enterprise to increase its profits by expanding the silver industry to the financial field. Mining projects have long cycle of development with a big number of uncertain factors. In addition, since price of silver fluctuates greatly, the development of single mining sector cannot effectively shift risks while development of financial sector can shift the risks by effective use of financial tools so as to achieve the preservation and appreciation of assets. Since a large amount of funds and related business in the mining industry are scattered in DST, there should be a solution on how to improve the efficiency of funds and reduce the financial cost. It’s appeared necessary for each sector to develop in a coordinated manner, and with comprehensive planning in order to improve the concentration of resource utilization and make full use of these resources. At present, the silver mining industry is actively reducing the efficiency and optimizing the benefit, conducting financial business, leveraging on capital market so as to alleviate the management pressure of the enterprise, and make the funds more used for industrial upgrading. He is a mobile internet entrepreneur and has many years of experience in managing commercial business and business management. Has established a foundation to support the development and training of blockchain. Vienna is an expert in finance. He is director of the Department of Economic Statistics at an American company and is currently a financial advisory consultant at an investment company in Labuan. Has 25 years experience in management. He is very productive in managing project operations, branding, consulting, and business strategy development. A marketing director in the Pacific region. He has served as a consultant in many companies.